Family is everything when you get married. They are there to witness your love and your commitment to someone. 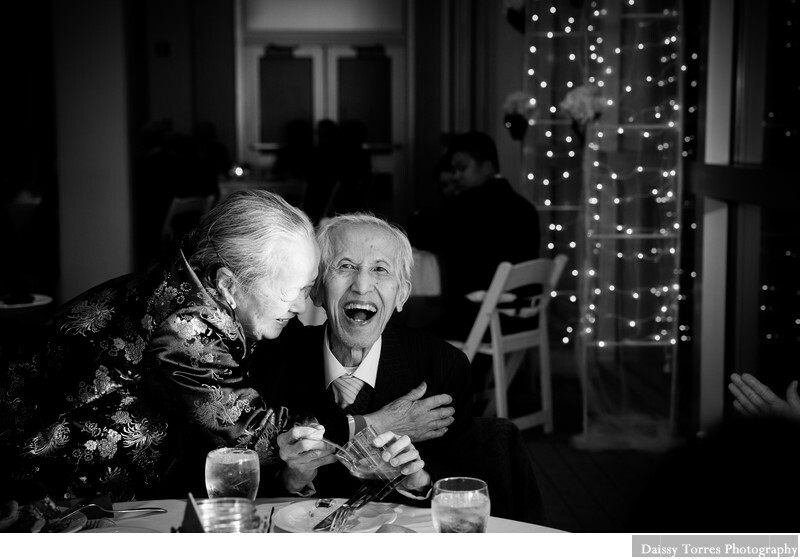 This image was a candid moment between Vet's grandparents. I had just round around taking photos of the guests at their table. As some couples do, Gretchen and Viet had little belts on the tables to signal when they should kiss and a couple of times the belts rang to signal Gretchen and Viet that it was time for their moment. As I am looking around for moments to capture, I notice Viet's grandmother reach out to her husband, kiss his cheek and then hug. I couldn't help but capture it, as I did he noticed it and burst out laughing. He didn't expect it and I am certain enjoyed every bit of it. This is one of my favorite images ever. I am a sucker for grandparents at the wedding. With grandparents of my own that I adore, I see their joy, their hopes and dreams being realized as they see their grandchild starting a new journey. So when you are planning for your big day, do not forget your grandparents. Keep them sitting close, visit them at their table often and talk to them. They'll have the best advice, the best hopeful look and will give moments like these to capture. Location: 717 General Booth Blvd, Virginia Beach, VA 23451 .